HANDY pacer Tom Me Gun should have little trouble returning to the winners’ circle at Albion Park tomorrow night. 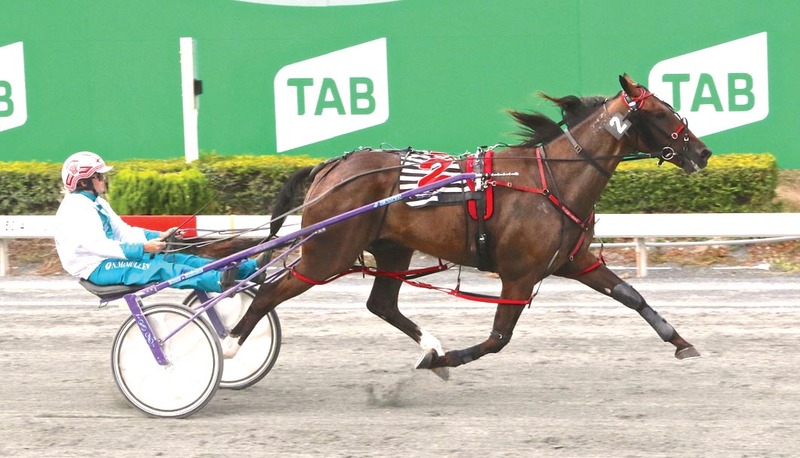 Shooting for a hat-trick at the same venue a fortnight ago, Tom Me Gun experienced a horrid run from his second row draw to be unplaced in an Australian Reinswomen’s Championship heat. Driven on that occasion by Kelli Dawson, the son of ill-fated stallion, Courage Under Fire, is ironically trained by Narissa McMullen, who won the Championship! McMullen will be back in the cart behind Tom Me Gun this weekend, with the gelding drawn well in barrier four. “He has a better draw this week and should be able to go forward and be up near the lead,” McMullen said. While she believes Tom Me Gun can hit his target, McMullen rates Jumping Jolt as a major threat. Also racing in solid form, Jumping Jolt will come from gate three for trainer Greg Elkins. “Jumping Jolt is quick out and should lead,” McMullen said. “He has been racing well and is the one to beat, especially if he does leads. With no major plans in mind for the six-year-old, McMullen will continue to select suitable races for Tom Me Gun.